Links to this page can be found in Book 5. 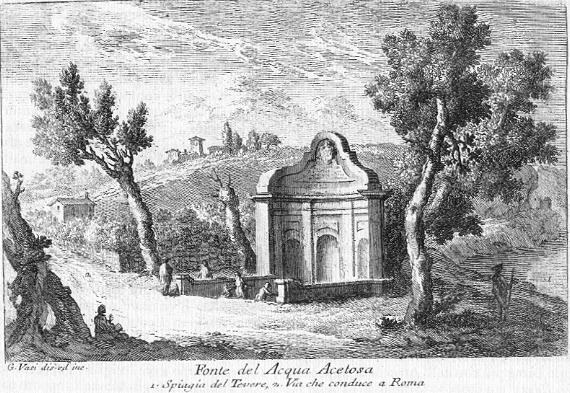 In this small 1754 etching Giuseppe Vasi shows people going to a mineral spring which was known for its beneficial effects; aceto means vinegar and acetosa is the derived adjective. 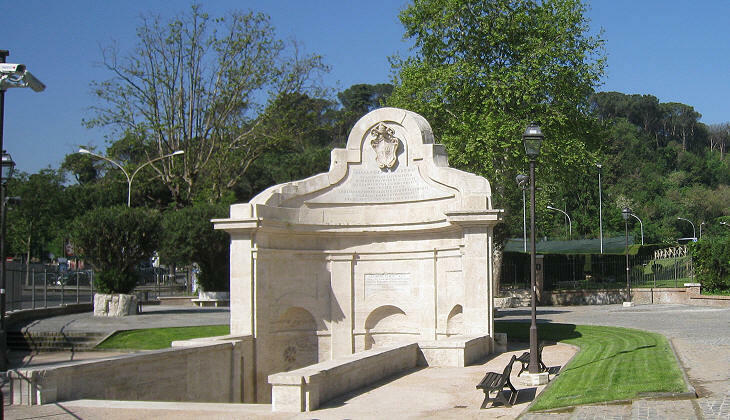 The spring was located near a beach of the Tiber and it was surrounded by trees, so the site attracted many picnickers. In the description below the plate Vasi made reference to: 1) Beach on the Tiber; 2) Street leading to Rome. The small 1883 map shows: 1) Fontana dell'Acqua Acetosa; 2) Ponte Milvio or Molle (which is covered in another page). In the XVIIIth century Acqua Acetosa was a countryside location whereas today it is close to very busy roads. After years of neglect the fountain was recently cleaned and a small fenced garden protects it from being vandalized with graffiti. 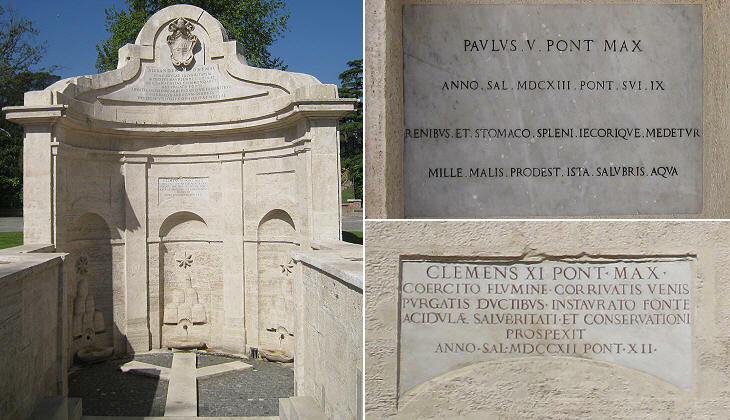 The oldest inscription of the fountain is by Pope Paul V and it says that the spring, in addition to being beneficial for loins and stomach, "Mille (a thousand) Malis (diseases) Prodest (is useful for) Ista (this) Salubris (saluber) Aqua (water)". The current fountain was built in 1661 during the pontificate of Pope Alexander VII and for a long time it was attributed to Gian Lorenzo Bernini, but more likely it was designed by Andrea Sacchi, who is best known for his paintings. 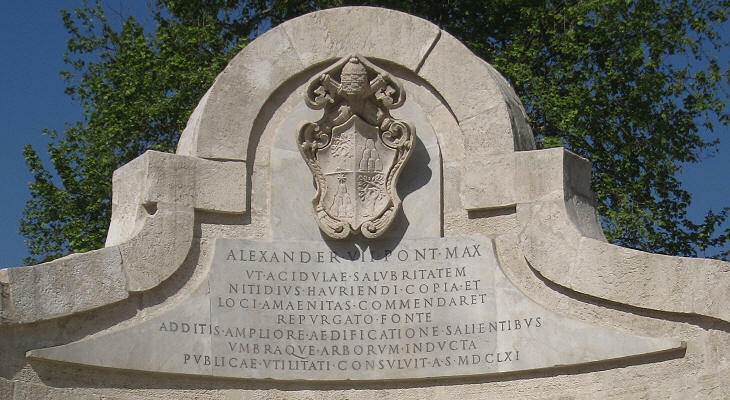 Pope Alexander VII wanted to be remembered for having promoted the construction of the fountain, which therefore was decorated with his heraldic symbols: six mountains and a star (you can see them also in the image used as background for this page). Drinking Acqua Acetosa was very popular, however in the text of Book V which provides information on the plates Giuseppe Vasi wrote that the mineral water violenta è nell'operare (has a too forceful effect) and that in general doctors were against its use. J. W. Goethe was happy with the effects of Acqua Acetosa; in summer 1787 he wrote: The heat is terrific. I get up at dawn and walk to the Acqua Acetosa, a mineral spring about half an hour's walk from the Porta del Popolo, where I live. There I drink the water, which tastes like a weak "Schwalbacher" (*), but is very effective. (...) The variety, misty transparency and colouring of this landscape drives me wild with joy. Italian Journey - Translation by W. H. Auden and Elizabeth Mayer - Collins. (*) Schwalbacher is a mineral spring at Schwalbach am Taunus near Frankfurt am Main in Germany. Due to pollution of the aquifer layer, the water of the fountain is no longer that of the mineral spring, but ordinary drinkable water. Next plate in Book 5: Ponte Milvio.